“Camp 14: Total Control Zone” is one of the most graphic and detailed documentaries about the police state in North Korea ever made. Released online in 2012 by Netflix, the 100-minute film by Marc Wiese (Germany) doesn’t seem to have a North American distributor. It seems particularly timely now, given the tension (and threats) created by North Korea in early 2013. The film presents an autobiography of Shin Dong-Hyuk, who was born in a North Korean labor camp. He would eventually escape at age 23 with the help of another prisoner, and escape into China, and then come to South Korea. He would marvel at his own psychological process, noting that in South Korea where people are governed by money, there is more suicide than in the North. He said that his life was empty in prison, and yet his soul was innocent. In the South, with freedom, he can become corrupt. The film uses many techniques for its storytelling. Often Shin, now in his later 20s, talks to the camera. The conditions in the camp are recreated with rotoscoic animation, often in near black-and-white. But there are stunning outdoor sequences showing Seoul, northeastern China, and areas near the DMZ. Given the location at the 38th parallel, one wonders why the climate is so cold. The official site (uses Quick-Time) is here. In the early parts of the film, Shin describes the boredom of the camps, and of his desire to pass time without too many thoughts. During the escape, he was burned on the legs by the electric fence, but able to continue to flee. He had to break into houses and steal from north Korean or Chinese villages to survive. He had no concept of what money was at first. I’ve always wondered if a “moneyless” society could be a good topic for sci-fi. Near the end of the film, there is a brief sequence where appealing American students at UCLA are shown helping him with a fundraiser. The Wikipedia article about the Kaechon Internment Camp is here. Wikipedia link for NASA photo of Korea at night, here. 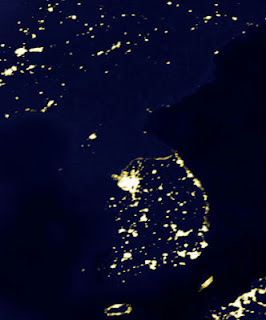 It's as if the DPRK immolated itself with an EMP blast, or lived out the NBC show "Revolution".